with the casters on the left and keybars, diecases, sorts boxes, etc., on the right. At the far end are shelves of the various spare parts that might, or might not, be needed. and relies on its gear box for the control of casting speed. Speed and metal temperature need to be set to match the size of type body being cast. Thus 6pt can be run at 144 rpm, but 72 pt runs at 2rpm. Also, the speed will change with the different set widths of the characters being cast, an i being much narrower than an m, for example, and thus needing less metal. The caster is not as clean as when it was new, but does work, and we have cast type and border units from 6pt up to 72pt, all these being for case, i.e. as founts to be kept in typecases for future use. The caster can only hold one matrix at a time, and the set width needs to be manually set for each character. Composition matrices come in three different sizes, and display matrices come in two sizes, and so a variety of hoders are needed. 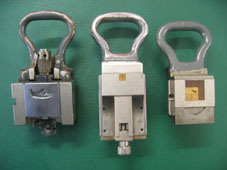 As yet, we have not tried casting leads, rules, or continuous borders, although we do have the attachments for these. 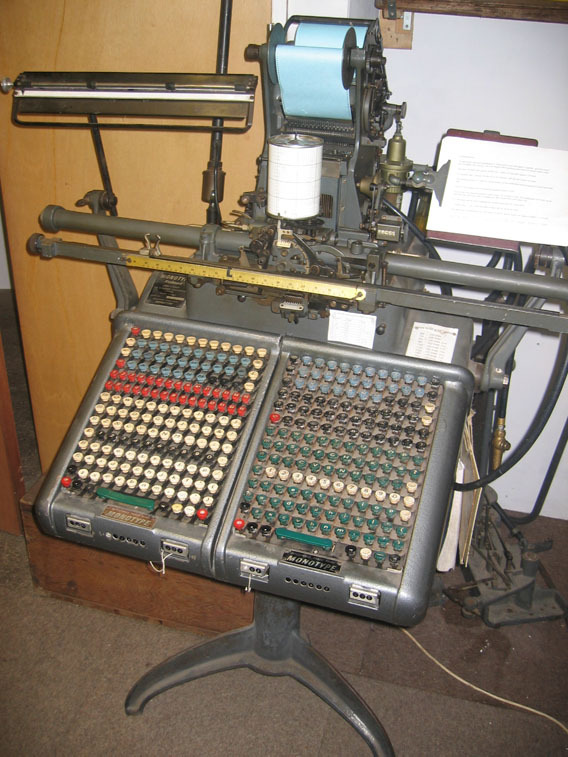 The press also has two Monotype Composition casters, used in conjunction with a pneumatic keyboard to produce complete text to the required line width. 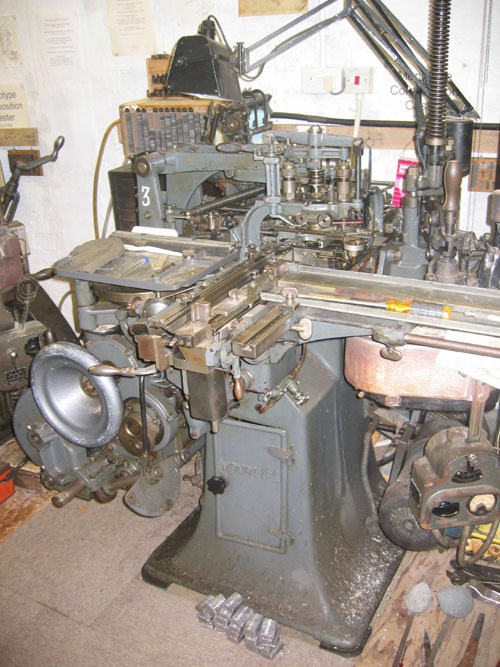 One caster is of 1968 vintage, and was originally owned by HMSO, and then the Black Swan Press of Grove. 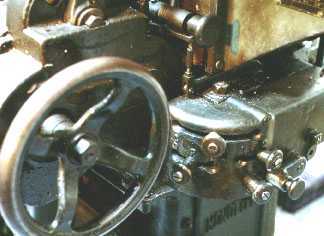 The caster is fitted with Unit Shift, and with Unit Adding. Unit Shift allows a sixteenth row of matrices in a diecase, but does require enhanced keybars and buttons for the keyboard. Its advantage is the extra 17 matrices provided by the new row in the matrix case, and also a greater flexibilty in arranging the matrices. Unit Adding allows any character to be increased in set width by 1, 2 or 3 units, which is useful for letterspacing, for example. The caster is slightly stickier to run than our other composition caster, since it has a single phase motor which often trips out in cold weather. However, it does have the advantage of the varigear and a rev counter and thus better speed control. We started learning to cast with this machine, and continue to use it for more experimental work such as non-standard composition, or display types. Our casting of composed matter is restricted to 14pt or below, as we have no large type composition matrices, but we have used the machine to cast sorts from 36pt U.S. display mats. 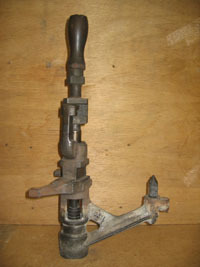 The other composition caster is of 1956 vintage, and again was originally owned by Heffers. This caster is 3 phase, but has no varigear, and simply uses a rheostat to control the speed. 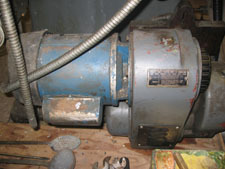 It is fitted with Unit Adding and with Unit Shift, and runs easily, being well worn in by its previous owners. We have used it for casting most of our books. However, as it has no gears, it does tend to slow down when the column pusher is activated and the type moved into the galley at the end of each line. 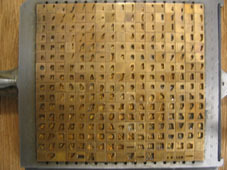 On the left is a picture of a completed galley of type, taken away from the caster, but before the type is moved to be proofed. All these casters work by heating typemetal in a pot, and using a piston (see left) to force the molten metal up through a nozzle and into a mould that corresponds to the required body size of the type. 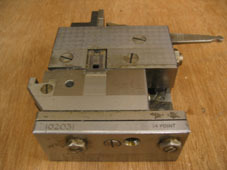 The top of the mould is sealed by the matrix, held in a die(matrix)case on top of the mould, and raised after each cast to allow removal of the type. The diecase usually holds full alphabets of roman, bold and italic, plus figures and punctuation, and with Unit Shift can hold 272 matrices. Type composition for the two casters is done on one of our two operational Monotype Keyboards. Both are 1971 vintage, one being ex Heffer and one ex GKN. 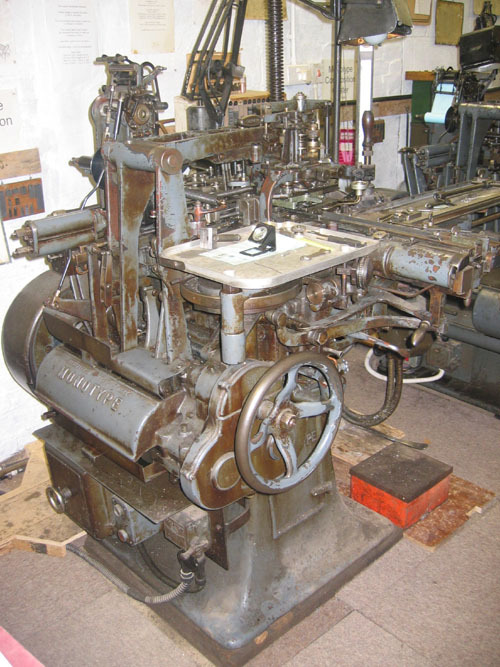 The advantages of using the Monotype equipment to cast our texts are that one does not need to hold large families of type in cases, and that there is no type to distribute once the job has been printed, as the type all gets remelted for the next job. It should also be quicker than hand setting, but this only follows if one is a reasonable typist, and a competant machine operator! 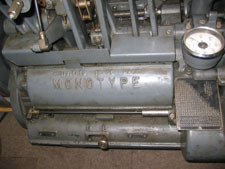 Monotype keyboards are powered by compressed air, and use a qwerty key layout usually with sufficient keys for roman, italic, bold and small cap alphabets. We have assorted mat cases, stopbars, wedges, justifying scales, etc., though most are for Unit Shift work, using 16x17 die (mat) cases, and 12/14 keybars and button (key) banks. However we also have some 11/13 button banks and keybars for 15x15 matrix cases, and 11/14 button banks and keybars for 15x17 matrix cases. 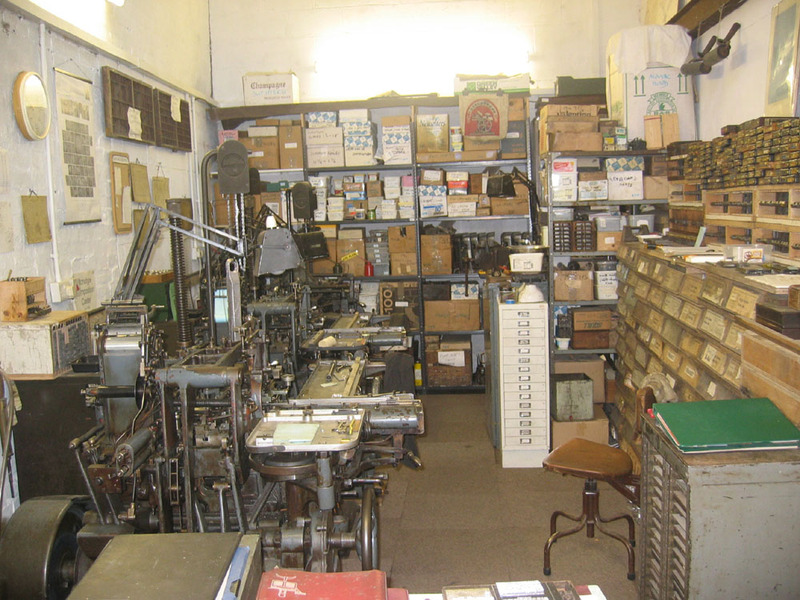 Below is another view of the foundry, looking towards the door. 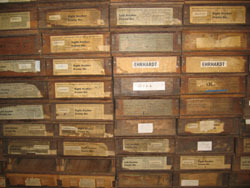 The two composition casters are on the right, the keybar boxes, diecases, and sorts boxes are on the left. The two keyboards are barely visible at the back, behind some galley racks. The far back, under the posters, has the shelves of moulds, justiying scales, and various other bits and pieces. 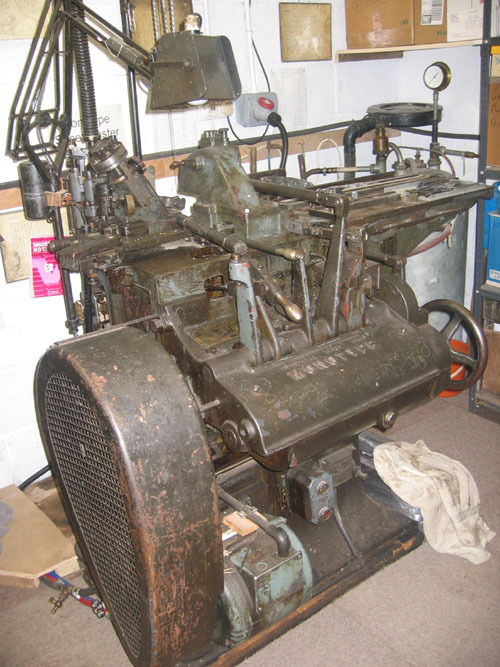 We did have a third composition caster, originally owned by Nettlefold (i.e. GKN) and dating from 1973, but we never got this back to full working order, and it has now been passed on to Chris Wilson, who intends to have it up and running again. We also had a third keyboard, again not quite working, and this has been got back into working order and passed on to George Miller, to help with his casting activities. It is always good for posterity, to try and keep the machinery in operation. After all, the machines themselves can outlive the operators, so their means of operation can only be preserved by new generations of users. 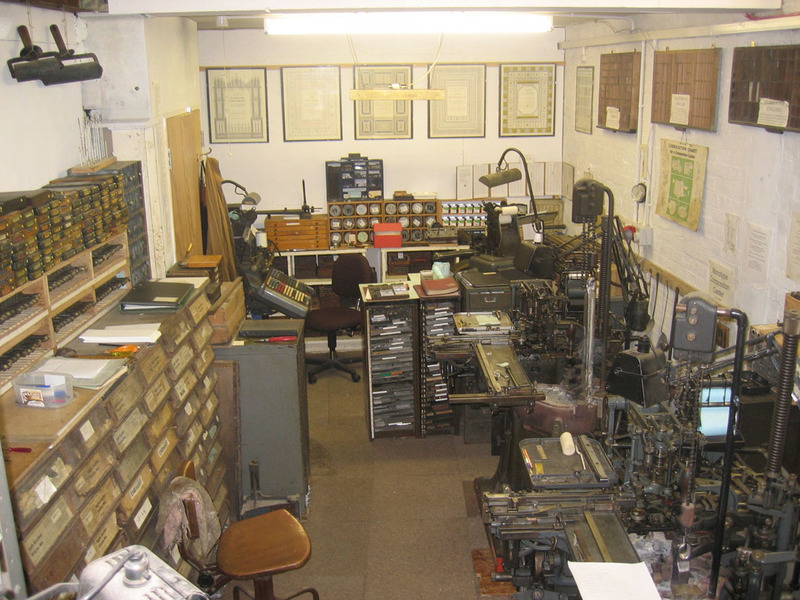 A Fine Press creating and printing limited edition books by traditional letterpress. This page was written by David Bolton and last updated 9 December 2011.